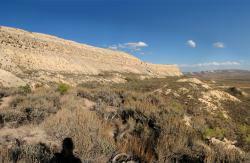 The Green River Formation: a fossil fiesta! According to their website, National Fossil Day is a "celebration organized to promote public awareness and stewardship of fossils, as well as to foster a greater appreciation of their scientific and educational value." This year the celebration is set for October 12, and like last year, I'll probably be doing several posts regarding fossils and the event itself over the next couple of weeks. So with that in mind, here's my first contribution. Skull of Amia uintaensis (bowfin): Large and well-preserved fossil fish from Fossil Lake deposits shows fine detail, including scales and skin. The full fossil is 49 inches in length. Science Museum of Minnesota collection.Courtesy Mark RyanTucked in a corner of the Dinosaur and Fossils Gallery here at the Science Museum of Minnesota is a display of fossil fish from the famous Green River Formation. The display offers visitors a look at some of the most well known fossils in the world. Visit a rock shop, natural history store, souvenir shop, or museum just about anywhere and you’ll find fish fossils from the Green River Formation for sale. Literally millions of fossils have been extracted from the formation, so it’s no surprise at all to find some in our paleontology gallery. The display represents only a fraction of the Green River fossils in the Science Museum of Minnesota collection. 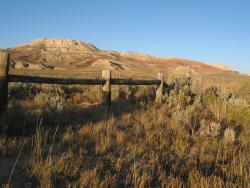 Fossil Butte: The butte stands in Fossil Butte National Monument and represents the ancient deposition remains of the center of Fossil Lake in western Wyoming. Limestone and mudstone layers near the top of the butte are rich in fossil fish and other fauna and flora from the Eocene Epoch.Courtesy Mark RyanThe sources of this splendid array of extraordinary fossils are the deposits left by three freshwater lakes that existed around 50 million years ago during the Eocene Epoch. These ephemeral bodies of water existed across 17 million years of time, and not all at the same time. Lake Gosiute was the largest in area with a diameter of about 200 miles. Lake Uinta had the most surface area and was the shallowest and existed the longest. Fossil Lake was the smallest and the shortest-lived – but the deepest. The lakes existed in a subtropical environment flush with all sorts of animal life from insects to mammals. More than 20 species of fish populated the waters while crocodiles, turtles and other reptiles basked along lake shores lined with lush forests of palm and fig trees. Birds and bats flew through the sky. Ferns sprouted in the shadowed woodlands of oaks and maples that grew up the slopes of the surrounding mountains. Fir and spruce trees existed in the higher elevations. Fossil remains from this past life are found in all of the basins where the three lakes once existed, but Fossil Lake, as its name implies, produces the most abundant Green River Formation fossils, especially fossil fish. Fossil Butte: The rich fossil deposits were first discovered by workers for the Union Pacific Railroad.Courtesy Mark RyanRailroad workers helping expand the Union Pacific railroad in the mid-1800s first discovered the fossil deposits near the town of Green River, Wyoming. The discovery soon drew the attention of scientists. A geologist named Dr. John Evans collected some of the first fossils from the region in 1856, and Philadelphia paleontologist, Joseph Leidy, soon after described for the first time, Knightia eocaena, the most common fossil fish found in the formation. Edward Drinker Cope, another paleontologist, also collected from the deposits and wrote several important papers starting in 1870. 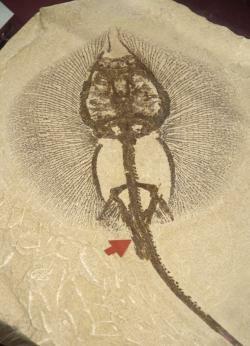 Heliobastis radiens: A stingray found in the Green River Formation deposits. Science Museum of Minnesota collection.Courtesy Mark RyanThe fossils on display at the Science Museum include Amia, Knightia, Diplomystus, and the exquisite stingray Heliobatis all preserved in buff-colored slabs consisting of soft lamination of mudstone, limestone, and volcanic ash. There’s also a slab of garfish, and an unlabelled predator named Priscacara next to the large palm frond on the wall near the entrance. Lance Grande (a graduate of the University of Minnesota and paleontologist at the Field Museum of Natural History in Chicago) is considered the leading expert in the fossil remains found in the Green River Formation. His book Paleontology of the Green River Formation (which I referenced heavily for this post) is considered a classic, and contains photos of many specimens found in the Science Museum’s collection. The two main fish-bearing units in the strata are the 18-inch Layer and the Split-Fish Layer. The formation is considered a laggerstatte (which means storage place) where nearly an entire ecological system is finely preserved in the fossil record. Several lagerstätten exist around the world but the Cambrian-aged Burgess Shale in British Columbia, and the Late Jurassic-aged Solnhofen quarry in Germany are probably the two best known. 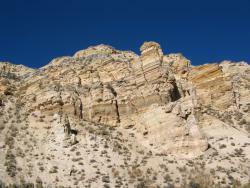 Green River Formation: Strata of the famed fossil-rich formation visible in Fossil Butte National Monument. The butte represents deposits from what was once the center of Fossil Lake that existed 50 million years ago during the Eocene Epoch in what is now western Wyoming.Courtesy Mark RyanThe deposited remains of what used to be the center of Fossil Lake today form a high butte in western Wyoming that towers a thousand feet above the Visitor Center at Fossil Butte National Monument. The monument was established in 1972 and is located 9 miles west of Kemmerer, Wyoming in the extreme southwestern corner of the state. Despite its somewhat isolated location, it’s well worth going out of your way to see. 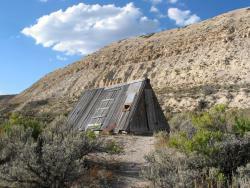 Abandoned workers' shelter: Historic Quarry at Fossil Butte National Monument.Courtesy Mark RyanMy brother Pat and I visited the area on one of our recent geo-trips out west. We first stopped at the Fossil Butte visitor center where, not surprisingly, some extremely rare and high quality Green River fossils were on display, including insects, lizards, turtles, crocodiles, birds, bats, and other mammals. Finely preserved fossils of leaves, cattails, flowers and fruit are also on display. We watched a short film explaining the area and the fossils found there, then Pat and I headed out to a nearby abandoned fossil quarry within the park for a bit of exploration on our own. We parked in the designated lot just off the highway, grabbed our packs and some water, and began our ascent to the Historic Quarry. The climb along the 2.5 mile hiking trail was no picnic – it took about an hour to get to the top, but information signs dot the trail to guide and inform you as you go along. 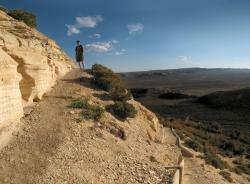 Historic Quarry: Pat Ryan stands level with the fossil-rich 18-Inch Layer located in the abandoned quarry at the top of Fossil Butte.Courtesy Mark RyanAnd the view of the wide Wyoming landscape is breath-taking. The main trail eventually runs parallel to the butte and along that stretch is an a-frame shack used by workers who excavated the quarry back when it was still operating. Every once in a while we’d come upon a slab of rock that had fallen from the fossil layer above. You could tell this by its buff color, plus one we examined contained the partial remains of the head of a Diplosmystus. The regular hiking trail took us about 600 feet above the highway, but to get to the 18-inch Layer we had to take a spur trail another couple hundred feet up above that. The 18-Inch Layer exposed at Fossil Butte's Historic Quarry: Fossils from this layer of the Green River Formation are exhibited in museums all over the world.Courtesy Pat RyanThe 18-inch Layer contains some of the best preserved fossils in the world, and is composed of limestone, oil shale, and volcanic ash. The lacustrine (lake) deposits are laid out in alternating pairs (varves) of light and dark layers each representing an annual cycle of sedimentation. 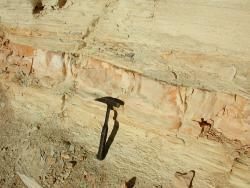 Overall there’s about 4000 years of deposition represented in the layer. Three feet beneath the 18-inch Layer (but not exposed at the Historic Quarry) is a second major fossil unit named the Split Fish Layer (or sandwich layers). This unit is about 6-1/2 feet thick and is so called because when the rock is separated, the fossils themselves split between the top and bottom layers diminishing the quality. When the layers of the 18-inch Layer are separated the fossils are found on only one sheet and protected under a layer of matrix that has to be expertly removed. 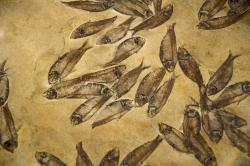 The Split Fish Layer fossils usually need little if any preparation. According to Fossil Butte museum curator, Arvid Aase, there actually exists several so-called split fish layers, three of them above the 18-inch Layer, along with what are called a mini-fish layer and gastropod bed. The fossilization process that occurred in the Green River Formation is unique in that the lakes contained a nearly perfect and ideal environment for preserving the delicate remains of its biosphere. A constant rain of calcium carbonate suspended in the waters insured that any dead creature or plant lying on the bottom would be covered and protected from bacteria or the elements. The deeper waters were probably anoxic – meaning lacking oxygen – which aided in further protecting the remains. The fossils are wonderfully preserved, showing fine skeletal details, scales, skin, and even feathers in some cases, all preserved as delicate carbon traces of the once living entity. Knightia eocaena: The most common genus of fish found in the Green River Formation. Remains are sometimes found in mass mortality layers such as shown here. Science Museum of Minnesota collection.Courtesy Mark RyanIt’s thought that algal blooms sometimes occurred in the lakes during the warmer seasons resulting in mass mortalities of thousands of fish. Large slabs containing more fossil fish than you can count are still being mined from the area. When I’m working my Tuesday afternoon shift in the Dinosaur and Fossils gallery at the museum I often carry with me a Green River Formation fossil of a leaf to share with visitors. I’ll scratch the matrix with a key or fingernail to allow visitors to experience the oily odor that that emanates from within the rock. Actually the odor is from kerogen a bituminous organic compound in the rock that serves as a source for oil shale, considered a substitute for crude oil. The Green River Formation contains the largest oil shale deposits in the world greatly exceeding the oil reserves of Saudi Arabia. Be aware that since the Historic Quarry trail is part of Fossil Butte National Monument, collecting of any kind of fossils is prohibited within its borders but fortunately several commercial operations in the area allow you to enter a quarry for a fee and dig up your very own fossils to take home. I’ve never done this so I can’t vouch for any of these commercial dig sites but I am including some links below for some of the more well-known ones in the area. But even if you can’t make it out to Fossil Butte National Monument this year, you can still come the Science Museum of Minnesota and see our collection, or visit a natural history museum in your own area. 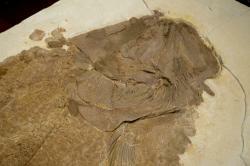 Chances are they’ll have some fabulous Green River Formation fossils on display to share with you. How cool! Some of these are my Dad's fossils and I remember our trips to Green River to find more fossils with Lance Grande when I was smaller :-) I feel thankful for those experiences!